1995. Ballantine. Paperback. 291 pages. This is the fourth book I have read by Lee Smith. Generally, I am not diligent about going through the backlist of authors, but Lee Smith’s storytelling abilities have given me confidence that no matter what I pick up of hers, I will be in good hands. Saving Grace is the story of Florida Grace Shepherd, daughter of a snake-handling itinerant preacher named Virgil Shepherd. Florida’s mother had been a dancing girl in Atlanta, with three children already from a previous marriage, when she met and married Virgil. The story gets its proper start when the family’s car breaks down in the Appalachian region of North Carolina and Virgil takes it as a sign that he should take up his ministry there, up by a place called Scrabble Creek. 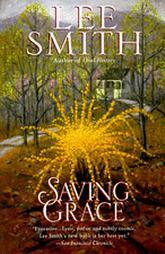 In Saving Grace, as with her earlier books, Lee Smith just nails it when it comes to capturing her main character’s years of girlhood. Through Florida Grace’s eyes of credulity, the world is filled with many wonders: her father handles snakes and drinks poison at his tent meetings and once she sees a little girl raised back to life in her family’s kitchen. But Florida also is wary of her father’s religion, and fears that her father will die of snakebite. She tries to establish a normal childhood at school, and covets the life of her best friend Marie. At Marie’s house, the two girls create elaborate horse stories and drink Coca-Colas while watching the television. These early years are filled with an evocative timelessness. Though various references vaguely place the story in the mid-20th century, it is not until Florida’s engagement to a man in Tennessee that a specific date is mentioned, a date that demarcates between her childhood and her life as a wife and mother. As with the other books I’ve read by Smith (and I don’t consider this a spoiler), the book ends with her protagonist returning to her home place, Scrabble Creek. I found the ending to be fitting, except for its abrupt switch into stream-of-consciousness narrative. In an interview included in this edition, Lee Smith said that Florida’s choice at the end of the book was not one that Smith personally wanted for her character, but it seemed the likely decision that Florida would make. Seeing as how I have mentioned Smith’s writing a number of times, it seems like I should include an excerpt. But I had never been anointed and prayed that I never would be. I always sat way in the back with Lily, watching what all went on. We played tic-tac-toe on a little pad of paper when things got boring. A lot of the time I got to stay home and keep Troy Lee anyway. Meeting was not really the place for children. God would send for you when He was ready for you. 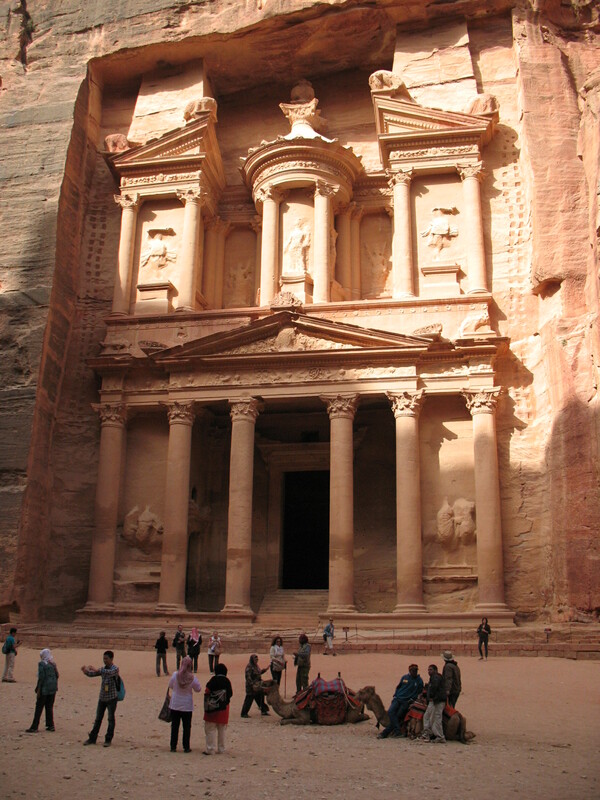 Picking up from where I left off in my last post, our travels brought us to Jordan’s perhaps most famous historical site: Petra. Jen, my sister and I walked from the Siq to the Monastery, with Jen taking a donkey part of the way. 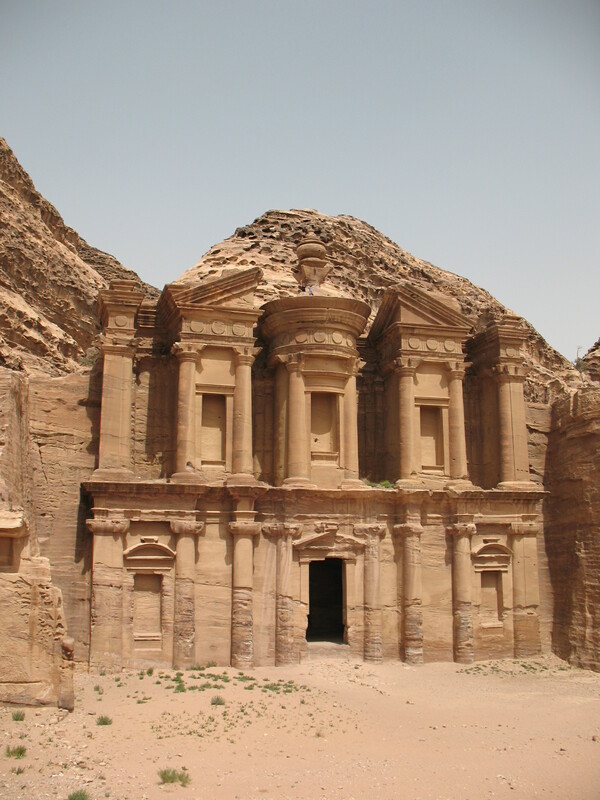 Thankfully, despite the previous day’s bout with sickness, we all were able to enjoy our experience of Petra and its many astounding facades, tombs and edifices. This will be primarily a post of photos. This puppy was desperate for some shade. Jen carried him around until we found a bush where we could put him. The Monastery. And if you look very closely at the top . . .
. . . you can see my sister and Jen! 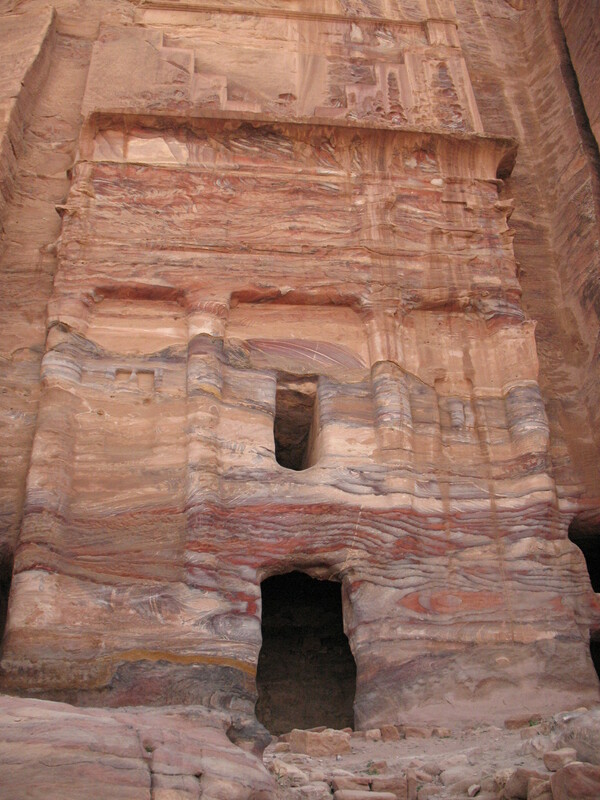 It was definitely a full day at Petra, but well spent. This trip took place all the way back in April, and I made posts for the first five days and then left off for a while. I feel the itch to complete what I started, even though it’s now November. 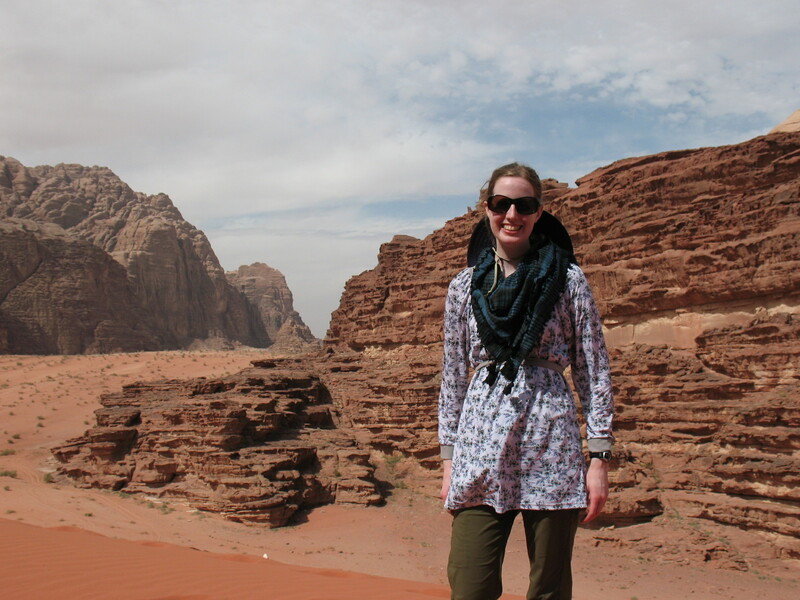 Part of what drives me to complete is that I really enjoyed my visit to Jordan. The sights were beautiful and almost everyone was really friendly to us there. Jordanian culture highly values hospitality, and we were the happy recipients of that hospitality on multiple occasions. Links to the earlier posts are located at the end of this entry, but I left off with a description of our visit to Mt. Nebo and the Dead Sea. 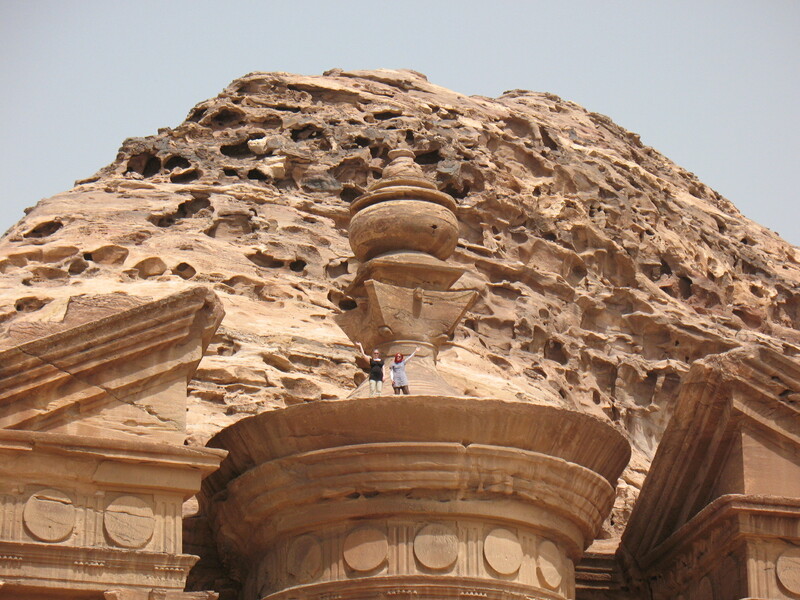 The day after that trip, my sister, my friend Jen and I drove our rented car down the bleak Desert Highway to Wadi Rum. 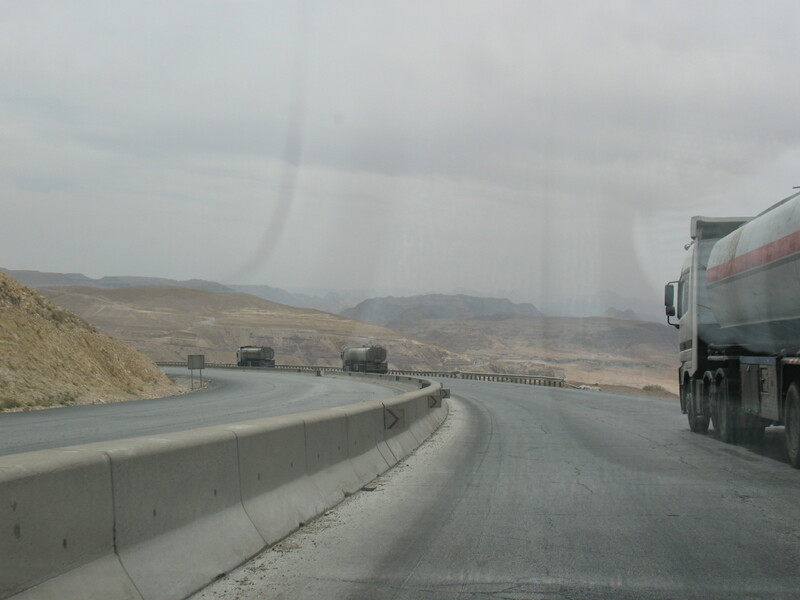 The bleak Desert Highway was dominated by trucks and potholes. 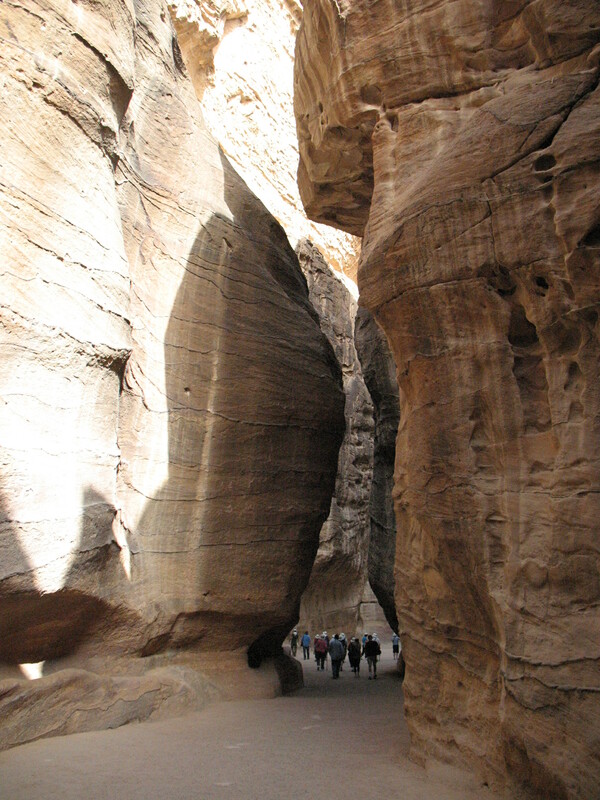 Wadi Rum is a protected area full of wondrous sandstone formations. 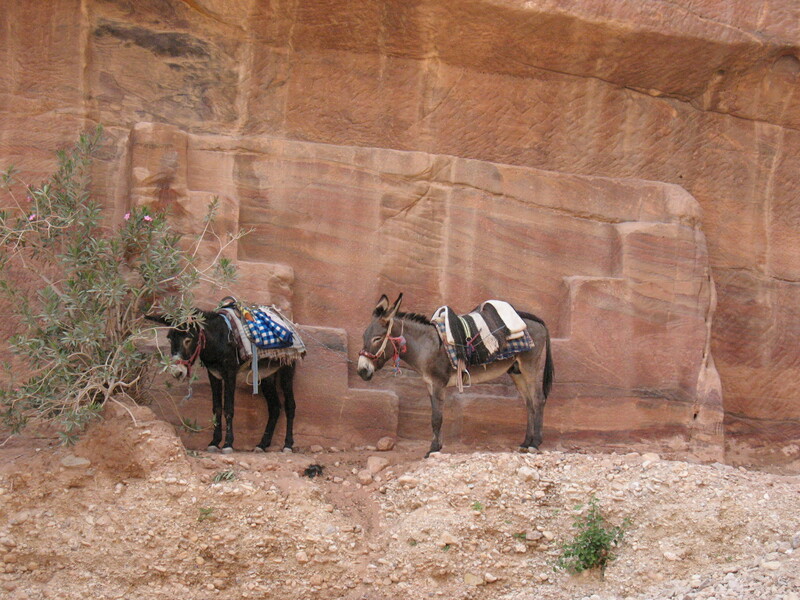 Only three particular bedouin tribes are allowed to operate tours out of Wadi Rum. 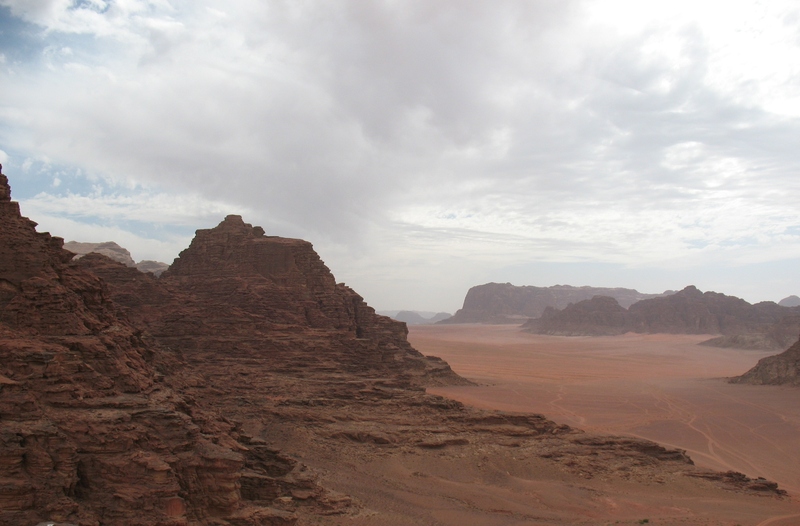 Wadi Rum looks very similar to some of the American West landscapes, and was a favorite place of T.E. Lawrence’s. Other activities involved scrambling up to some natural rock bridges. My sister was like a mountain goat and did most of the climbing in her bare feet. I was the one hanging back from the more precarious spots. On our tour, we also saw some cool petroglyphs of people and camels – a few were located in this lovely shaded ravine, a spot I particularly enjoyed, maybe because it didn’t involve heights! Standing in front of the Wadi Rum landscape. Our jeep tour deposited us at our camp for the night. The three of us would be sharing a tent room; each of us had a sturdy cot and plenty of blankets. We enjoyed some tea again, and then scattered ourselves among the neighboring rock formations to watch the sun set over the desert. Dinner was plentiful and delicious, prepared by the guide’s wife who we had had the privilege of meeting earlier. We were joined at dinner by other tourists: a British couple and their adult son as well as a Jordanian man, his German wife, their son and her parents. 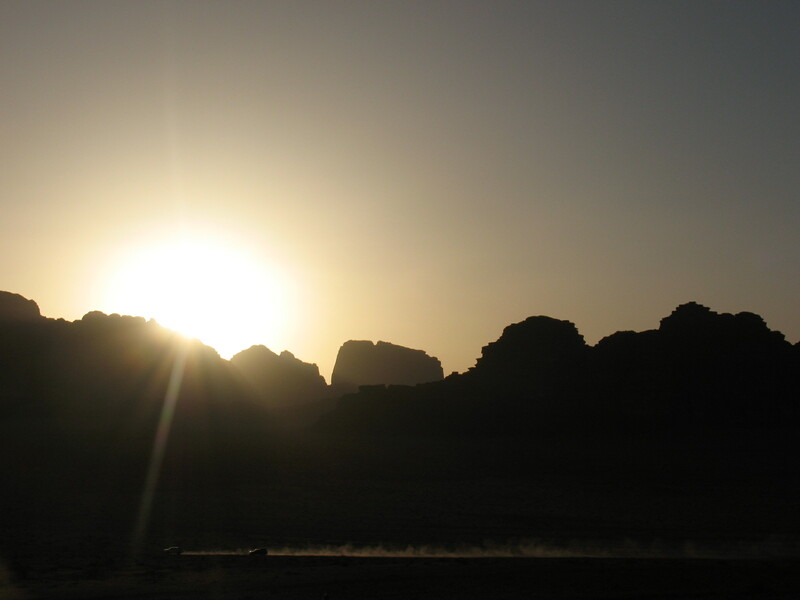 Sunset in Wadi Rum, with a couple of trucks speeding along in the foreground. After dinner, my sister, Jen and I went out to the rock formations again to look at the stars over the desert. My sister and I come from a musical family and Jen is also a singer, so we felt moved to sing songs out into that big space. I particularly remember that Jen sang Sara Bareilles’ “Once Upon Another Time” and it sounded very pretty and haunting; I was also impressed by Jen’s memory as she sang the whole thing. I count this time under the stars in Wadi Rum as one of the best experiences in my life. The next morning, we took a long camel ride back to the village of Rum, with a guide who walked the whole way back next to the camels. 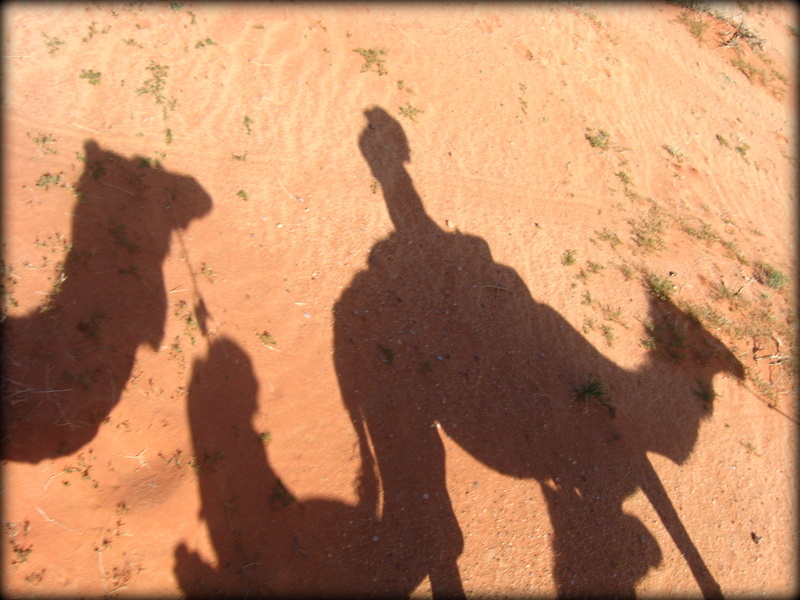 My camel was the lead camel. The other two camels wanted to run, but mine was more interested in eating plants out of the ground and I wasn’t enough of a disciplinarian to stop her. We did let the camels run a couple of times but it was a bit too much jostling for my taste. Picture taken by my sister. 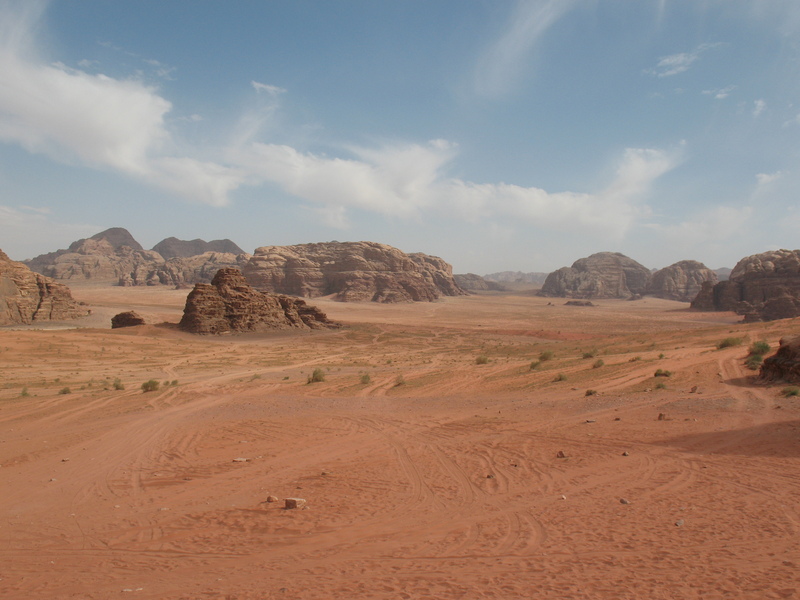 Our visit to Wadi Rum ended on a somewhat distressing note when the three of us accidentally witnessed an unpleasant interaction while returning from the camel paddock. So we were contemplative and sad when we left Wadi Rum. 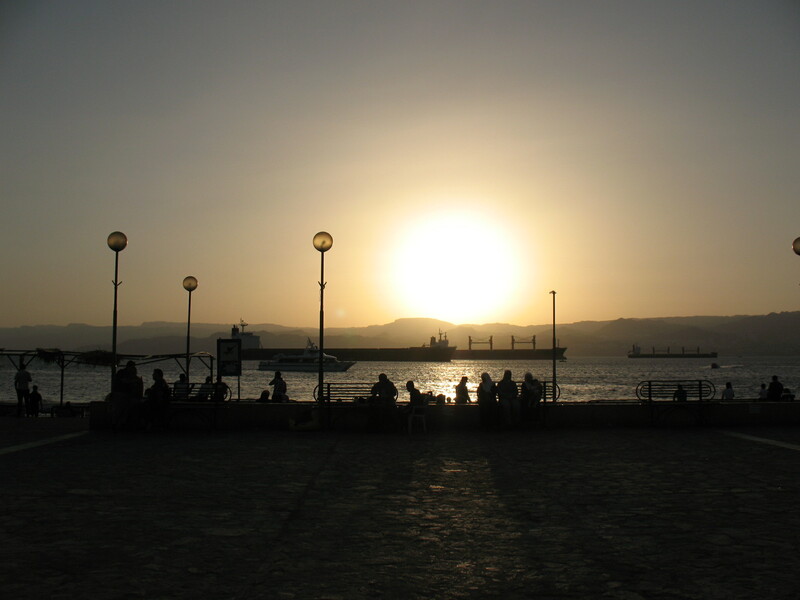 We arrived late in the afternoon in Aqaba and stayed with an American family that my sister knew. It was very warm as we walked by the Red Sea. 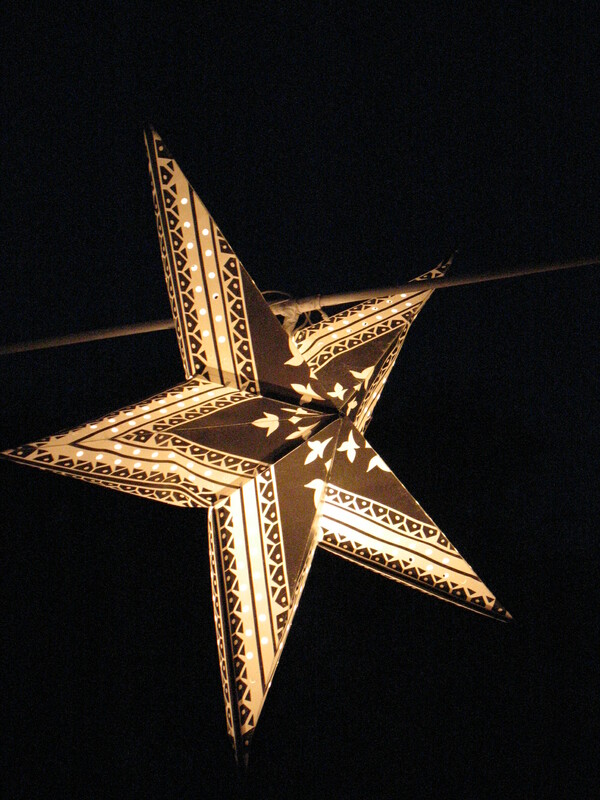 We stopped by an outdoor market called the Souk by the Sea, which had been decorated with lighted paper stars. We lingered to hear some live music and all in all, had a pleasant evening. Unfortunately, early the next morning, I woke up feeling sick to my stomach. Jen also felt unwell. My sister fortunately felt fine. Since we had all ordered the very same thing at the restaurant the night before, we did not think it was food poisoning. We had planned to go out on the Red Sea in a glass-bottomed boat, but we scrapped all of our Aqaba plans and just lay about our rooms feeling miserable. My sister played nursemaid. I craved applesauce (the one food I can tolerate when I’m nauseated) to the point of fixation, but managed to get down some oatmeal. 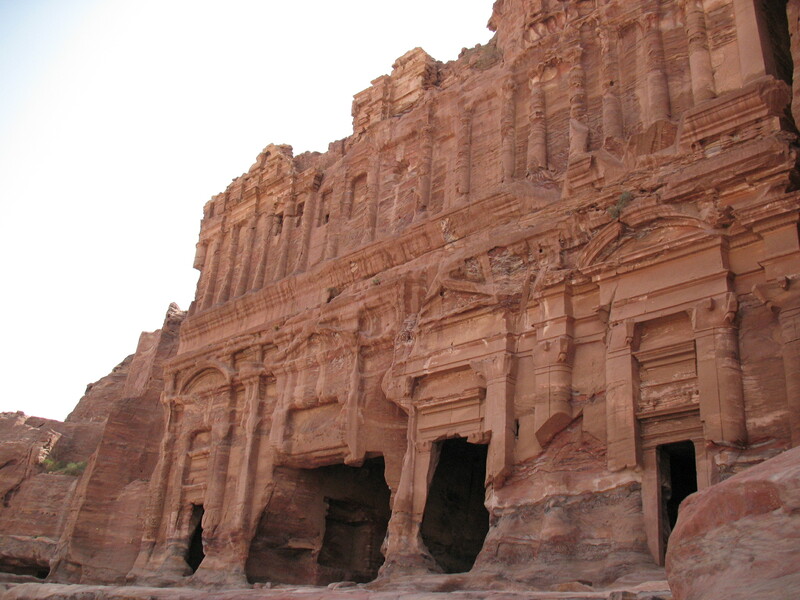 While my body was inert, my mind was frantic with the idea that the next day (day 9) was our day in Petra, and I did not know how to make myself feel well. Jen seemed to be coping somewhat better than I, though I don’t think she was any less sick. 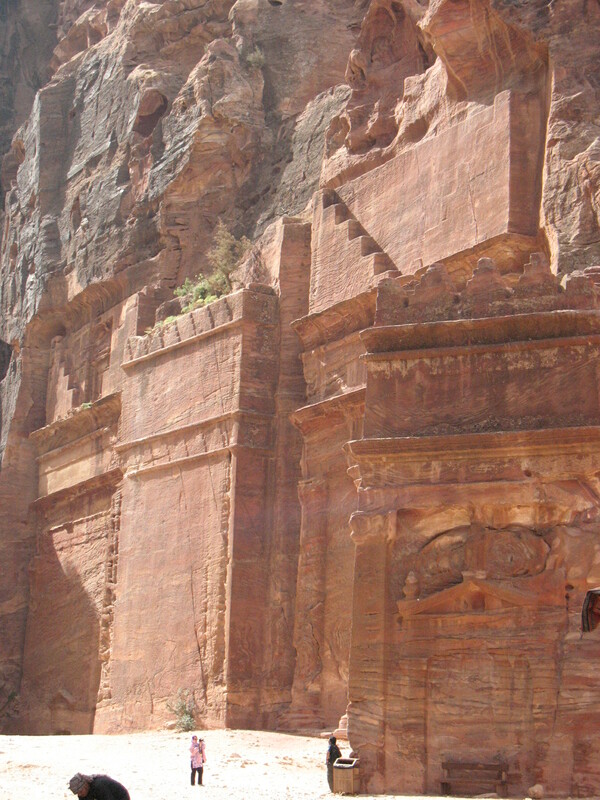 In the late afternoon of day 8 (which I now think of as the Lost Day), we drove to our hostel outside of Petra. The several hour drive felt tortuous as I tried to curl up in the backseat over sometimes bumpy roads. The hostel owner was very nice and chatty and I wished I could respond with more than baleful looks from the lobby armchair where I had dropped myself. Later, while I was cocooned underneath blankets in our hostel room, my sister made a little pile of gently bland crackers and tea biscuits on my nightstand, which she had scavenged from a nearby convenience store. She watched Percy Jackson and the Olympians: The Lightning Thief on the television set in our room. I woke up several times and began to feel less terrible each time. The next morning, Jen and I, while not at 100%, proclaimed ourselves fit enough to take on Petra, which I will post about next time. The results are in and #10 was the number picked for the Classics Club Spin event. From my list of twenty books created last week, Peter Fleming’s 1933 travel memoir, Brazilian Adventure was chosen to be the book I will commit to reading by January 1, 2014. I first heard of Brazilian Adventure from Jenny’s 2012 review at Shelf Love, and her review convinced me that the book should go on to my to-read list. Excerpt from her review: “Fleming tells his story with style, in an offhand, witty-banter sort of way that makes you feel as if Peter Wimsey at his most urbane were ushering you up the Amazon. He talks as if piranhas are a big disappointment because they didn’t even try to devour him the second he dropped a pinky in the river”. Based on my enjoyment of books such as Redmond O’Hanlon’s Into the Heart of Borneo, I think that Brazilian Adventure and I will get along swimmingly. Also, two cool facts: Peter Fleming was the older brother of Ian Fleming, creator of James Bond. And Peter Fleming married Celia Johnson, the actress who starred in the wonderful David Lean film, Brief Encounter. A check of my local library’s catalog did not yield the book, so I will probably end up buying it used online. Several years ago, I came across a copy of my great-great grandmother’s journal. 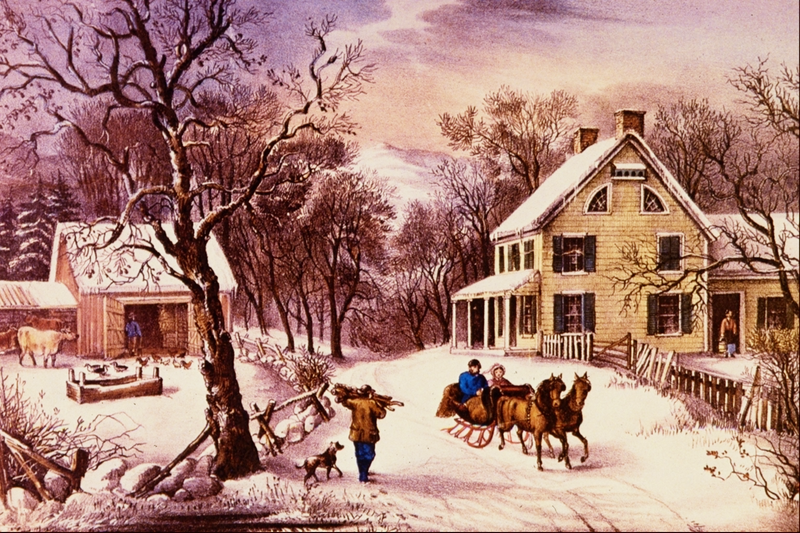 My great great grandmother’s name was Emma Tilton Richards and she lived in Williamsburg, Massachusetts. The journal was kept from 1888 to 1902. In 1933, someone had transcribed the original diary on a typewriter and then later someone else made photocopies of the typewritten version. A few weeks ago, I asked to borrow this copy of the journal so that I could copy it over into a Word document. I know that scanning the journal and using some sort of free OCR (optical character recognition) technology might be faster, but it would possibly be less accurate, and frankly, more boring. I enjoy the immersion experience that re-keying the journal provides. So far I’ve copied through April 1888. In the journal, Emma and her family (husband Frank and five kids, plus Frank’s parents who live with them) often seem to embody the expected vision of hardworking, rural New England life. Frank spends the first few months of 1888 packing the region’s apples into train cars to be shipped to New York City and elsewhere. In the early spring, the oldest son, Prescott, collects sap from a tree on their property and they make maple syrup. Emma’s mother-in-law seems to be regularly making pies, cakes and fried doughnuts. They ride about in sleighs. [Tues., Mar. 13 1888] Wind blows fearfully all the time. We are drifted in completely; between the house and barn drifts higher than a man’s head and in front of the house it is so high that we cannot see out unless we look through the upper sash. The roads look as though we should not see many travellers at present. [Fri., Mar. 16, 1888] Pleasant. Grandpa has walked to the village this P.M. but no mails in yet – only as they have been brought by hand. General blockade of business all over N.E. and York State – even as far So. as Washington the storm was quite severe. [Sat., Mar. 17, 1888] Pleasant and not very cold. Mother baked bread, and ginger snaps and fried doughnuts. Grandpa walked to the village again this P.M. One team passed here today that had been all day coming from Conway. Frank came tonight giving us all a surprise. Left his horse in Huntington. He was blocked in Chester Hill until Thurs. P.M.
“. . . I kept thinking she would better if we could only keep her strength up – so Mon. morn the 24” I wrote to mother that Prescott and Ruby seemed better. But Ruby breathed her last at about 10 o’c that A.M. . . . She has gone up higher. The medicine did not work on her at all as the Dr. hoped it would, and I do not know as any human power could have saved her. We all felt fairly stunned by the blow, but we went about making ready for the funeral. Grandpa took Mr. Sanderson’s horse and drove to Conway & Frank went to Florence to get a casket and to make other arrangements. Mrs. Sanderson came up with things needful to do some baking. Re-reading the above journal entry is even more moving now that I’ve been copying over the journal, because I feel quite familiar with and fond of my ancestor, her family, and her neighbors. As a way to experience history, reading this journal has been a fascinating portal into late 19th century American life. I probably would be faster at copying over the entries if I didn’t keep stopping to research some term, event or person online. I’ve learned that the apples they harvested were likely dominated by the Baldwin variety, which was very popular at the time. Emma proudly mentions opening up a barrel of Baldwins with “not a decayed one to be seen.” The variety waned in popularity during the early 20th century and then a hard winter wiped out most of the great Baldwin orchards in the 1930’s, though it is a variety that still exists today. My dad, who has cultivated apple trees, said he had a Baldwin once. The Prohibition movement is mentioned several times – I know Emma mentions a rally, and I think in 1889 she mentions that there is a vote on the issue for the Massachusetts state constitution. Nearby Smith College was still quite a new institution and is referenced a number of times in the journal. A minister mentioned in passing – a Mr. Thorndike – was likely, based on time and place, the father of Edward Thorndike, a man I hadn’t heard of before but who is apparently considered a pioneer in the field of educational psychology. Delving into this journal has been an exciting project – to the readers out there, have you also come across an ancestor’s diary or letters? What cool things have you learned by reading them? 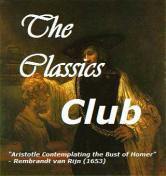 I’ve been part of the Classics Club for a year now, and though I’ve been steadily reading and reviewing some classics, I haven’t really participated in any of the “events”. But I saw that there was another Spin challenge in the works, so I’m going to take a gamble and join in! Post that list, numbered 1-20, on your blog by next Monday, November 18. Monday morning, we’ll announce a number from 1-20. Go to the list of twenty books you posted, and select the book that corresponds to the number we announce. Now, I’ll just have to wait and see! Most hoping for Mrs. Mike, most dreading Farewell to Arms (I don’t think I like Hemingway.) Oh and in case you were curious, I like a good chunkster in the winter months, which is why they are not in the Dread category. 2011. Pegasus Books. Hardcover. 325 pages. In this memoir/biography, Kimi Cunningham Grant recounts her maternal grandmother’s story of internment during World War II. Grant’s grandmother, her Obaachan, was interned – along with her family – for being Japanese Americans in California (the entire West Coast was declared a war zone in March 1942). Obaachan’s story is framed by descriptions of Grant’s visits with her grandmother, who was at first reluctant to share her story, partly because this time of her life was shrouded with a sense of haji, or shame. As the visits progress, however, Obaachan seems to become more comfortable with sharing her experience. I decided to read this book primarily because I went to the same college as the author. I don’t think we ever shared a class, as she was a couple of years ahead of me, but I knew who she was. When I heard she’d published this memoir, I decided to add it to my to-read list. Part biography and part memoir about a grandmother/granddaughter relationship, past and present is not strongly demarcated in the narrative of Silver Like Dust. Sometimes the grandmother’s story is told in the form of a conversation between Kimi and Obaachan, and sometimes it is straightforward third person biographical narrative. Grant’s writing style revels in small details, which was sometimes lovely, but sometimes came off as a wee bit labored, especially in the beginning. However, by the time I finished the book, I was quite settled into her style. 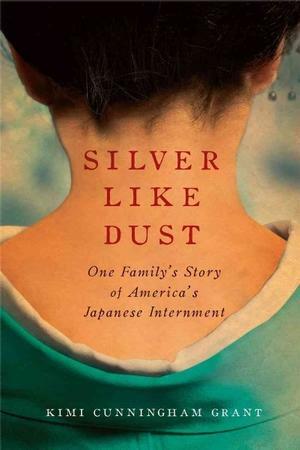 Although I was aware of the internment of Japanese-Americans in the 1940’s, this was the first time I’d read a nonfiction story of someone who experienced internment. Obaachan was twenty years old when she was sent, along with her parents, to Heart Mountain, Wyoming. Her married sister went to a different camp, in Arkansas, with her husband’s family. In jarring counterpoint to the family’s internment, Obaachan’s two brothers both served in the U.S. military during World War II. The injustice of this chapter in U.S. history is understood through small details. Before the internment, the freedoms of Japanese people on the West Coast was gradually curtailed: curfew, and the confiscation of their guns, swords, and shortwave radios. Obaachan’s family did not have guns or swords, but they knew other Japanese families who had to surrender heirloom samurai swords. While temporary interned at the Pomona fairgrounds, the Japanese prisoners were switched from traditional Japanese food to more starchy, bland fare, which caused digestive problems for many. When they were moved to Wyoming, most of them – Californians – did not have the winter clothing necessary for the climate. The U.S. government eventually distributed peacoats to all of the prisoners. But perhaps the saddest examples of injustice were the major life events that occurred in that camp. Obaachan met and eventually married another prisoner. Their trip to Cody for the marriage license was “chaperoned” by a military policeman and a camp administrator. Their first child was born in the camp and Obaachan’s mother died at Heart Mountain (this detail is not a spoiler, as these facts are revealed in the prologue). I enjoyed reading about Kimi’s growing closeness to her grandmother. I happened to be reading this book while visiting my own ailing grandmother in Vermont, in what turned out to be the last week of her life. While there, I read a short informal autobiography my grandmother had written in the 1990’s. I also read some pages of my great-great grandmother’s diary. I identified with the way Kimi steeped herself in family history and also felt the gentle poignancy of her relationship with her grandmother.